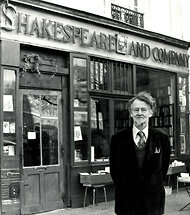 George Whitman, the owner of the bookstore Shakespeare and Company, died on December 14, 2011, at the age of 98. Whitman went to Paris from the United States after his service in the Second World War, and stayed. 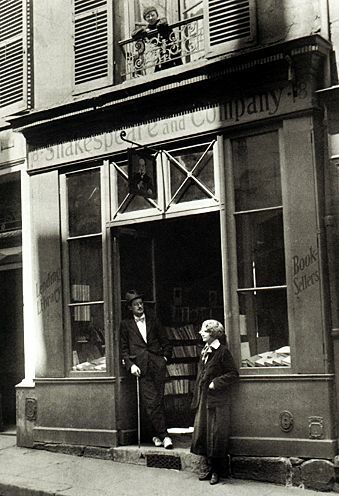 He opened the store in 1951 as Le Mistral, and renamed it in 1964 after the death of Sylvia Beach, who ran the original Shakespeare and Company before the War. Beach, you may recall, published Joyce’s Ulysses when no one else would. On the Left Bank, Shakespeare and Company sells new and used books primarily in English but also in other languages. Because it has nooks to read in, and encourages lingering, it seems a refuge. During a trip to Paris, novelist Barbara Sibbald was wishing her French was better when she found the store: “I was wandering around the Notre Dame grounds and ventured across the bridge and la voila! Shakespeare and Company. I felt a frisson of connection to all those writers who had passed time there. I bought a copy of Gertrude Stein’s Selected Writings and settled in on a bench outside the store, feeling perfectly at home.” For over sixty years, Whitman gave a bed to some 40,000 visitors, who were writers or aspiring writers. The bed came with conditions: the visitor had to work in the store for an hour or two and read a book a day. They were also invited to read aloud their own work. Whitman had retired in 2006, leaving the management of the store to his daughter, Sylvia Beach Whitman. While keeping the store more or less as it has been for decades, Sylvia Whitman has introduced some changes — such as bringing in a telephone. (Is it a rotary phone or has she jumped ahead of The Word bookstore in Montreal?) She published the fourth issue of Paris Magazine, which can be viewed and bought online. The store hosts readings, workshops and performances. It also sponsors the Paris Literary Prize. Reading the obituaries of George Whitman, I noticed that the bookstore’s history as a cultural institution was frequently summed up by naming famous writers. For example, in the Montreal Gazette, Catherine Bremer (Reuters) mentions that “Whitman’s shop became a stopover for writers like Miller, James Baldwin, Samuel Beckett, Anaïs Nin and later on Lawrence Durrel, William Burroughs, Gregory Corso and Ginsberg. Beat poet Lawrence Ferlinghetti became one of Whitman’s closest friends.” Jeanette Winterson, writing for the Guardian of her 2009 stay at the bookstore, claims that Hemingway liberated the store at the end of the war, and goes on to mention the same writers above. What about Canadian writers? Didn’t John Glassco hang out in Montparnasse? Did Mavis Gallant never set foot in the shop? Surely some Canadian writers have laid their heads on the bookstore’s beds? If you know of a Canadian writer who did a stint at Shakespeare and Company, please satisfy my curiosity and fill out the comment box by clicking on the balloon above. One last thing. 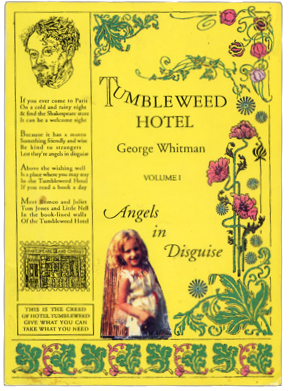 The yellow, green and pink bottom border of the Tumbleweed Hotel page on the bookstore’s website looks very like a cover of an early Tamarack Review. A design of the time? Anybody? Morley Callaghan was in Paris at the same time as Hemingway and may well have spent time at Shakespeare and Company. I guess I’ll have to add his memoir, That Summer in Paris, to my reading list. Unless…. Is there a Callaghan fan or scholar who would like to submit a few hundred words about his time abroad? Share a review of his book?